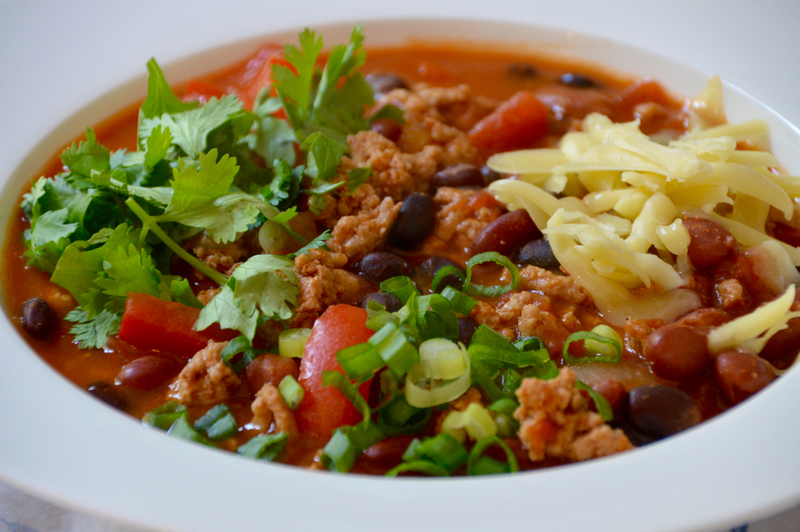 There are a million chili recipes out there, but none quite like this one. 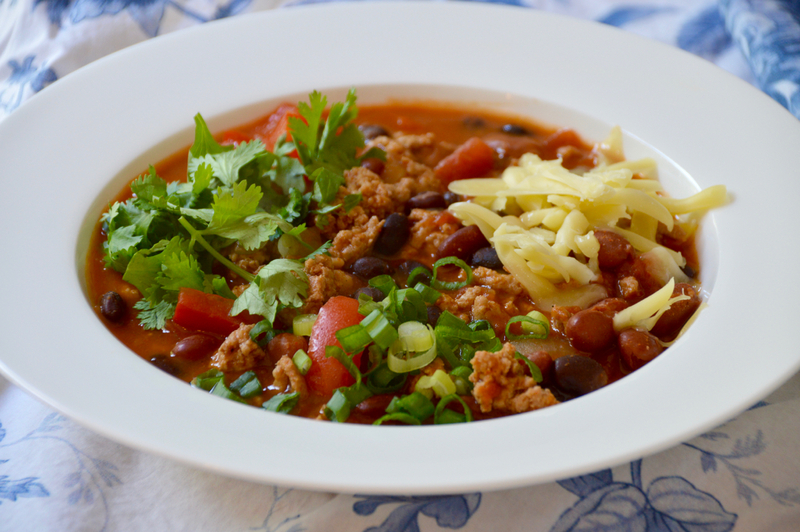 In our house, we love this turkey taco chili because not only does it taste great from day one, but you can also freeze it or keep it in the fridge for a few days, and the longer it sits, the better the flavors get, which is why this is a featured dish on my meal delivery menu. Packed with flavor, healthy proteins, and just a few ingredients, this quickly has become part of the rotating schedule in our house! I have to admit, this recipe has a lot of cans, but in reality, don't we all need a few recipes in our rotation that just require opening some cans, putting it all together and all of a sudden you get this seriously yummy meal? I can't knock the can recipes, because you'd really never know unless I told you. There are fresh ingredients in there too - peppers, onions, garlic, scallions and cilantro. You can easily make your own taco seasoning too - really all it is is some paprika, chili powder, cumin, cayenne, oregano and salt. For this recipe though, I suggest using a packet of taco seasoning to make life easier. My go-to is the Trader Joes taco seasoning, and it's only $.79 per packet, and you can get two meals out of that one packet! (Unless you love spicy foods, and then you use the whole packet for one meal). This is super easy and so yummy, I hope you enjoy! In a large pot, heat oil over medium-high and add turkey, cooking and breaking it up into pieces with a wooden spoon. Once turkey is cooked through, add onion, pepper, garlic and taco seasoning. Str to combine, and let that cook about 5 minutes to cook down slightly. Next, add tomato sauce, rotel, refried beans, broth, red beans and black beans. Stir to combine, then bring to a low simmer. Cover and cook 15-20 minutes. Garnish with scallions, cilantro and/or shredded sharp cheddar cheese.